Redmi Note 3 user can download MIUI 8.5.2.0 Global Stable ROM for their phone and install the same on the phone. The new version of MIUI 8 for Redmi Note 3 is released. The update comes with lots of fixes like Swipe to delete Lock screen notifications, UI adjustments for toggles, Changed icons for USB charging, Home screen settings added to the Settings and lots more. 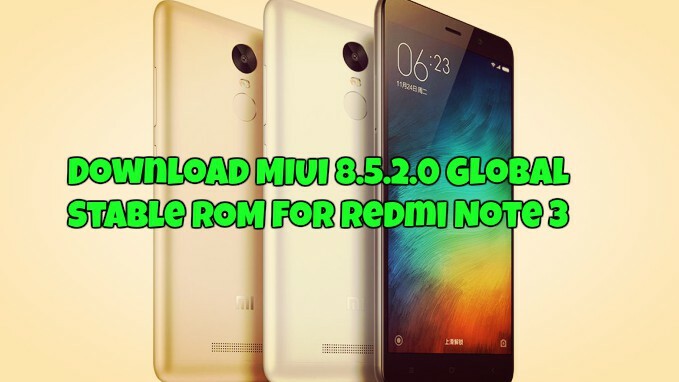 To update your Redmi Note 3 with this MIUI 8.5.2.0 Global Stable ROM all you have to download one file and flash the same with the recovery method or the fastboot method. You can Download MIUI 8.5.2.0 Global Stable ROM for Redmi Note 3 from the below mention links and use our guide to update the same. This guide is only for the Redmi Note 3 users, and this will now work on any other Xiaomi phones. As we mentioned earlier that this one is the new official update and very soon you will get the OTA update of the new firmware. To check the update go to Settings -> About Phone -> System updates -> Check for update. If you can’t see the update, then follow the below mention steps and update Redmi Note 3 with MIUI 8.5.2.0 Global Stable ROM. 1. Make sure to take the backup of your phone. Suppose something goes wrong during the installation then you can easily recover your data. 3. If you are using the Fastboot method to install this update. Then download these two files. a) Download Mi Flash Tool to Flash the Fasbtoot ROM on your phone. b) Download Mi Suite to install the Latest Xiaomi drivers on your Windows PC. 1. Recovery Method – By Flashing the Recovery ZIP file on your phone. 2. Fastboot Method – To flash the Fastboot MIUI ROM with the help of Mi Flash Tool. Recovery method is one the easiest way. All you have to save the Recovery ROM on your phone and run the update application on your phone and locate the ROM file to install the update on your Redmi Note 3. But sometime this method will not work if you are in any older ROM or you are running China or Developer ROM. Then you use the recovery method to install the GLoabl ROM on your phone. Fastboot Method is the long method, and it will take some patience and time. In this method, you have to install the MI flash tool on your Windows PC and install the Fastboot ROM for Redmi Note 3 with the help of this tool. Safe and secure method to update any Xiaomi phone with the latest update. You can find the detailed instructions here how to use Recovery and Fastboot method to update Redmi Note 3 with latest MIUI Update.